This school assembly also addresses the role of anti-bullying in bullying behaviors, since so often it is a group of kids abusing a single individual. James encourages students to be willing to stand up to the group, or at least walk away, and not be led into bullying behaviors by their friends. This is the question James asks throughout this challenging and powerful anti-bullying school assembly program. 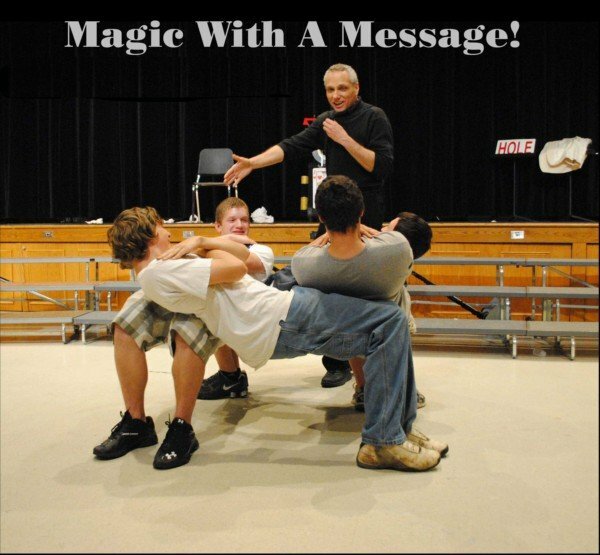 James uses his magic to demonstrate the power of influence, and challenge students to hang with people who really care, and who are positive role models. Your energy was great, your message was great, and it was just what we wanted to tell the kids about anti-bullying. Everyone loved the assembly!